Inspired Engagement is an Authorized Five Behaviors of a Cohesive Team Partner providing a complete menu of products and facilitated custom workshops to support you, your team’s development to be a Performance team . 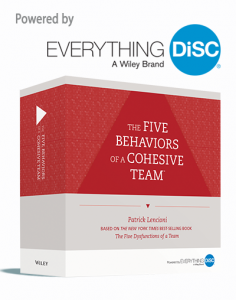 The Five Behaviors of a Cohesive Team™ is a unique learning experience powered by Everything DiSC® that prepares individuals for success in teams. 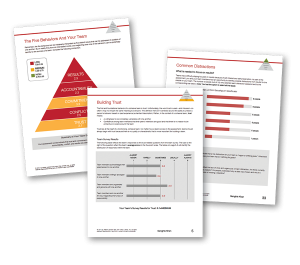 The New York Times best-selling author Patrick Lencioni and the power of industry-leading workplace assessment tools come together in a breakthrough program proven to deliver business results. The program helps teams understand how they score on the key components of The Five Behaviors model: Trust, Conflict, Commitment, Accountability, and Results. Individual team members will learn about their own personality style and the styles of their team members—based on the Everything DiSC® model—and how their style contributes to the team’s overall success. The Five Behaviors of a Cohesive Team™ is a unique learning experience supported by All Types® , an MBTI type assessment that prepares individuals for success in teams. The New York Times best-selling author Patrick Lencioni and the power of industry-leading workplace assessment tools come together in a breakthrough program proven to deliver business results. The program helps teams understand how they score on the key components of The Five Behaviors model: Trust, Conflict, Commitment, Accountability, and Results. Individual team members will learn about their own personality style and the styles of their team members—based on the All Types® (like MBTI®) model—and how their style contributes to the team’s overall success. Contact Inspired Engagement today to purchase your DiSC and Five Behavior products.